Seasons Resort Cozy Townhouse Slps 9! Great Rates, Location and Yr Rd Amenities! Many Weekends offer a 3rd night for $40. Many 4th or 5th Mdwk nts are $40. or free in April, May, Sept, Nov & first half of Dec. but not over holidays or school vacations) For these offers, please contact me thru homeaway messaging so I can adjust the quote before you pay as they longer allow calls or emails between owner and guests until reservation is paid for. My Rates are overall 50% lower than going directly thru the resort. Rates Include ALL onsite amenities with Clubhouse. If you wish the cleaner to launder the linens you use upon your departure, you may arrange that with me AHEAD OF TIME and the fee will be $15. for each load up to 2 loads. Otherwise, your cleaning fee is $60. paid via Homeaway. As you can see, my rates are very a great value in the Seasons ! Pet Fee is $20. per nt or $60. per stay, per pet. We have tried to keep rates at the lowest possible to enable affordability for families without sacrificing quality to help you make your stay great! Awesome peaceful & attractive popular 45 acre condo family resort. 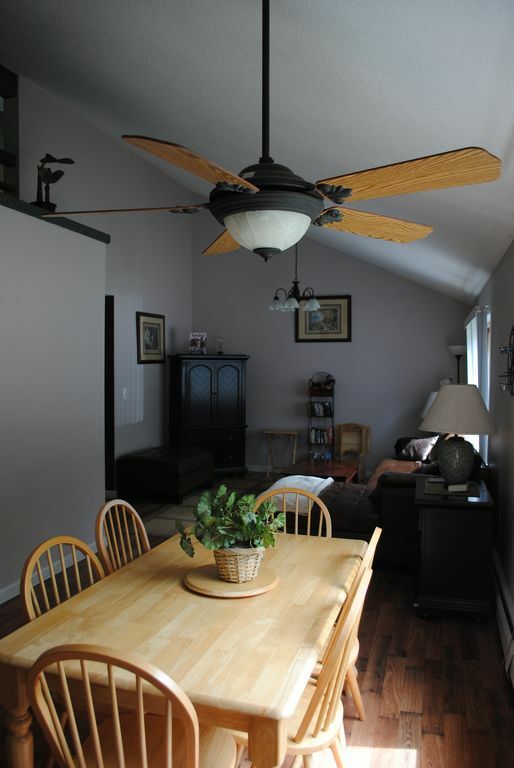 Located in the heart of the White Mountains where there is so much activity in every season. Free Internet in the unit or Clubhouse or your laptop. This unit faces the national forest on one side. Private deck w/ views. It is considered a two bedroom, although it actually has three bedroom areas with changes made to the original upstairs. On the first floor is the KING Bed in master bdrm. On the second floor is the Loft with a Set of bunks, a trundle bed & two twin beds on one side of loft. A Queen bed on other side with a wall separating the 2 Bdrm areas for sleeping privacy so that it acts as two bedrooms upstairs however between these rooms is a wall and not a door. There is a doorway to go downstairs via the large loft room. Treated with TLC, enjoyed by many families. Some return & time again, children feel like it's another home for them. Open living room /dining area, laminiate floors. Llnens provided. Dedicated to making it feel like home for vacationers at low rates. Waterfalls, golfing, swim, lakes, hiking, skiing, biking, eve entertainment,dining, outlets, craft & antiquing. Firepits on property available throughout the year. Onsite amenities are great and well maintained! The Clubhouse, enjoyed by all ages, includes Indoor Pool & adjacent sundeck (overlooks playground), Jacuzzi, sauna, changing room, exercise area, ping pong, game of pool, game room with video games, air hockey & snacks, catch n release pond, and skating area. Lounge area with chess/checkers wooden tables, oversized T.V. and nicely decorated comfortable furniture. A great place to relax while kids play! This place has been a lifesaver for families on rainy days! Video rentals at front desk. Internet access available in condo or at the Clubhouse via your laptop. Take time to explore the area with all its natural beauties but also take the time to relax on the porch of the condo or the clubhouse porch, go for a hike right outside your door into the White Mts. nature trails, feed the ducks at the pond, bike ride with the kids, play tennis or try out the basketball hoops. Fire pits offer you to build a fire in the fire pits. Make your smores! Pet trails are available for your use. If you do not make use of the trails for pets to go potty, please walk across the street along the forestr for them to go "potty" instead of on the front lawn. Full kitchen with Microwave, coffeemaker, toaster, toaster oven ,George Foreman grill, crockpot, dishwasher, cooking utensils, pots and pans, blender, mixer. etc..... Please note There is NOT a telephone in my condo for those of you who only use landlines. The office has one for emergencies. Barbecue grills located throughout property. Washer/dryer in condo. A/C, C.D player, 2 Cable T.V.s, ceiling fans, standing fans, iron, hairdryers. The SEASONS, though built in the mid 80's is maintained so wonderfully! Individual units can vary as owners decide to choose to improve and upgrade.I work hard to insure that my place is clean, cozy, ongoing improvements. Parking in parking lot at the unit itself as well as an overflow parking lot by clubhouse for additional guests. Area Activities: Outlet Shopping, antiquing, hiking, rock climbing, biking, golfing, tennis, basketball, miniature golf, fishing, hunting, waterfall exploring and viewing, scenic picnic spots, swimming, boating, theatres, museums, water skiing, jet skiing, rafting, downhill skiing, c.c.skiing, snowmobiling, sledding. 3 Miles from Storyland and 1 Mile from Attitash Ski Resort. Near other Ski resorts. Nearby: Echoe Lake State Park Mt. So even in the 'quiet' times of year, there's still plenty to do! About 1 3/4 hrs. from Manchester NH Airport. About 2 1/2 hrs from Boston's Logan Airport.Best bet if flying is Manchester, NH Airport. Our family and friends have enjoyed years of stays here and hope other families continue to do the same. The Seasons has much to offer. Read below under Why This Property and Unique Benefits. Please feel free to email us! Excellent Value in the area with all its amenities! Great seasonal deals. Details in "description section". For these offers, please contact mevia messaging and don't pay on instant booking or homeaway will charge you the regular rates. Once you message me, I can edit the quote if it falls during a time period when I offer and additional night at a huge discount or a fee night. Homeaway does not have the technology to set it up this way yet for owners and guests. So always check with me as I often offer deals that the site is not ready to be able to calculate. Well maintained resort and condo unit. Work hard to make your stay special! What is it near?Fall -Enjoy all of the activities, and experience the magnificent beauty of the White Mountains in their glory during fall foliage! Winter -Polar Express, Downhill Skiing – Attitash, Black, Bretton Woods, Cranmore & Wildcat Cross Country – Bear Notch Ski Touring, Great Glen Trails, & Jackson Ski Touring Tubing – Cranmore, Great Glen Trails Skating – The Seasons, Nestlenook Farm, Ham Arena Snowshoeing – Rentals available throughout valley with 100’s of AMC trails to choose from! Shopping – Tons of outlets, antiques, and specialty slopes Dining – From Fast Food to Fine Dining, the Mount Washington Valley has it all! Summer - Family Attractions – Attitash, Clark’s Trading Post, Heritage, Santa’s Village & Storyland Outdoor Activities – hiking, biking, canoeing, fishing, & enjoy a ride on the Wildcat Express! Shopping – Tons of outlets, antiques, and specialty shops Dining – From Fast Food to Fine Dining, the Mount Washington Valley has it all Other Activities: Snowmobiling, snow-shoeing, camping, leaf-peeping Ski: Stay in the heart of New Hampshire's White Mountain ski country! You're just 1 mile from the lifts at Attitash Mountain and Bear Peak, and you're 15 minutes from Wildcat and Cranmore. You'll also be close to Jackson and other local X-Country Nordic skiing centers. Individual units from 8,000 - 15,000 BTU'S for each living area. Linens provided, you must launder them prior to your departure. Stackable wash/dryer. Bring your own detergent. Parking available right in front of the townhouse. If more than 2 cars, you will need to park the 3rd one in the "overflow lot" by the clubhouse. (Unless it is a VERY quiet off peak season. Available in condo or clubhouse with your own computer. Linens provided, please launder them prior to your departure. This keeps my rates and cleaning fee low. Full Living room. Easy to seat 8. Full kitchen and applianced. Just bring your food! TVs in livingroom, master bedroom and in loft. There are a few stairs going up upon entering the bldg and then a few stairs gong back down once in the bldg. Unless you have a ramp, it would not work if the person cannot walk any stairs without a ramp. Inside the condo, the master bdrm is on the 1st floor so no stairs needed to climb once inside condo. Themes (additional info from above) This describes the sort of vacation guests would enjoy in the property. This resort and its location provides travelers for the following experiences! adventure, away from it all, budget, family, historic, romantic, shopping, tourist attractions, nature seekers! ON SITE EVENTS: Family Movie Nights	Summer - Thursday and Sunday (Fathers Day Sunday thru Labor Day) ~~~~~~~~~~~~~~~~~~~~~~~~~~~~~~~~~~~~~~~~~	Seasonal Bonfires Schedule Spring - Saturdays (Memorial Day to Father's Day Weekends) Summer - Wednesdays and Saturdays Fall - Saturdays (Labor Day to Columbus Day Weekends) ~~~~~~~~~~~~~~~~~~~~~~~~ NEW! Catch and release pond! ~~~~~~~~~~~~~~~~~~~~~~~~ Newly upgraded PLAYGROUND!!! ~~~~~~~~~~~~~~~~~~~~~~~~ Clubhouse with gamerooms, ping pong, game of pool, arcade games, foolsball. ~~~~~~~~~~~~~~~~~~~~~~~~ Small Skating Rink Seasons maintained (weather permitting:) on property as well as pond. Condo is in great condition with all of the amenities you need for a home away from home. Beds were comfortable and the unit is surprisingly spacious for only being one bedroom plus a loft. Owner was responsive and professional to work with. Only reason I didn't award it 5 stars was the indoor pool was disappointingly cold. Most resorts keep their pools 80-82 degrees. The Seasons pool was 77 at the surface and probably significantly colder than that below. The amusement area in the clubhouse was great fun with our young son. Proximity to skiing was great. This is our second year staying at Seasons, and this was our first time at Patti Anne's condo. It is a lovely condo with everything you need and plenty of sleeping space. Just a note the upstairs loft bedrooms do not have a door, there is a 3/4 wall between one room with a queen bed and the other room with two twins and a set of bunkbeds but no door and its not private. This wasn't an issue for us as we were just two couples and one stayed downstairs in the room with a king size bed. But just an FYI for future travelers, probably a great situation for a family where they want to keep tabs on the kiddos in the space next to them. I would highly recommend this condo to anyone looking to be close to Attitash and have lots of space to sleep. We loved the large living room sectional couch as well. Lots of seating space for everyone. Very nice townhouse near many attractions. My family and I spend several days at this townhouse. There was plenty of room for us to roam around. We were 4 adults and 2 children. The townhouse has all you need for cooking utensils. We had all our meals there. It was clean and efficient. Water pressure was good. We did lose the hot water one evening. Don't know what happened but it was all set by the morning. The owner was very attentive and responded in a timely manner. Would definitely rent here again. Beautiful clean had everything we were looking for. Will be staying again. Kids loved the pool, hot tub and game room. I’m so glad that you enjoyed your stay and enjoyed all the accommodations. There is certainly something for everyone there and the location is wonderful so that’s what guests love. I know the importance of family is going and feeling comfortable and feeling like and tell me. I hope you return! Quiet property with a clean, comfy condo. My family and I stayed in Patty’s condo for our Christmas vacation. First of all, Patty was very friendly and accommodating to deal with. Any questions I had, she responded quickly, and made it very easy to handle the “business” end of the transaction. The property was clean and well kept. It even has a few running brooks. The condo was nice and clean with a lot of odds and ends you may have forgotten. A 45 Acre Condominium Resort known as 'Seasons at Attitash' in Bartlett NH have been popular for years. It is 7 min from the village of North Conway located in Mt Washington Valley. On Rte 302, 1 mile from Attitash Mt and Attitash Slide Adventure, 3 miles from Storyland, minutes from Wildcat Mt, Mt Cranmore, Black Mt, the myriad of shopping outlets, plentiful and beautiful waterfalls, lakes, golf courses, tons of hiking trails, a few Outdoor Recreation Centers, endless places for swimming, boating, fishing. Conway Scenic Railroad, Cog Railway, theaters, Outlets, Campgrounds, Ski Rentals. Property set back on 45 Acres, peaceful, family friendly resort with amenities. On site barbecue grills. indoor heated pool, sauna, excersize room, huge hot tub, changing rooms, games rooms,(pool. foolsball, airhockey, ping pong and a ton of arcade type electronic games), playground, nature trails, duck & skating pond, tennis court, basketball, bonfires in summer and fall 2x a wk, dog trails ,video rentals, internet access, wildlife viewing, the unit is pet friendly. Area Taxis. Homeaway Payment Instructions: For all stays: A damage deposit of $250. to reserve stay. This is returned to you after your departure. After you depart, no damage and keys are returned to me, this is credited back to you on your credit card. Cancellations: Outside of 60 days of arrival, full security deposit and payment refund. Within 60 Days prior to arrival date,your damage deposit will be returned in the form of a give credit for another time choosing an off peak season midweek stay time (subject to availability). I will try to re-rent your stay and if I can re rent it, you will be issued a credit towards a future stay of the same type season and nights originally reserved.This stay would be based on availability and reserving within 60 days of the arrival date.Storms or hurricanes: No refunds but a credit will be issued for another stay based on availability and reserving within 60 days of arrival date. For Weekly Stays, "Lowest Rates guaranteed in Seasons resort for this quality stay. Add 9% Tax. Damage Deposit due to reserve. Cleaning Fee included if left with minimal cleaning. NOTE: I suggest DO NOT USE THE "Quoteable Rates" Button for OFF PEAK times as usually my rates come out less as homeaway does not have a way to calculate discounts or special offers. For example, For OFFERS of: 3rd night free, 3rd nt $30. or $40. or Free 3rd nt on weekends, the quotable rates won't calculate discounts into price & quote would be higher than my special! OFF PEAK DISCOUNTS usually: Midweek most of Fall, Spring Season. SKI SEASON: Many 3rd nts on wknds are discounted hugely during these times. Many 4th or 5th midwk nts during ski season is hugely discounted. Check with me 1st before obtaining a quote from Homeaway so that you can pay the lower rate if offered. Pets considered. NOTE: Pet Fees are $15. per night or $70. per stay. Homeaway does not have a way of calculating it correctly so your quote will be incorrect from them. Check with me 1st.